= Aspatharia divaricata (Martens, 1897). — IUCN (2017). = Aspatharia divaricata (von Martens, 1897). — Graf & Cummings (2011). 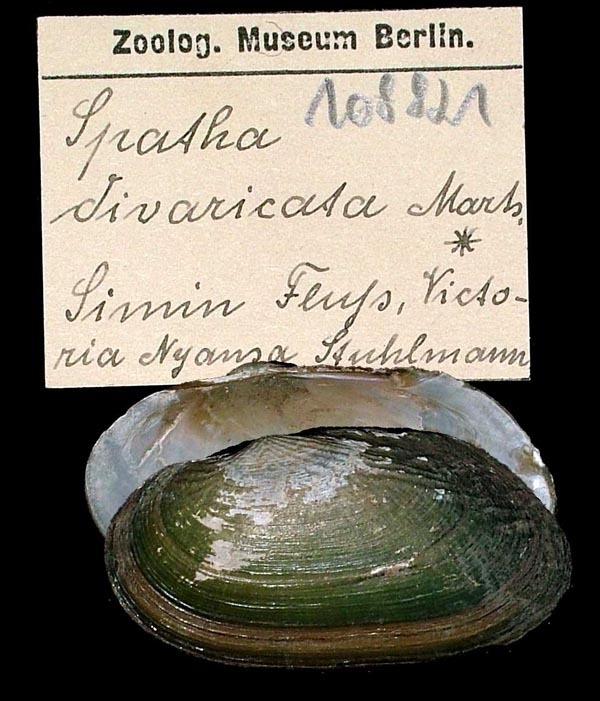 = Aspatharia divaricata von Martens, 1897. — Bogan (2010). = Aspatharia divaricata (von Martens, 1897). — Graf & Cummings (2007). = Aspatharia divaricata (von Martens, 1897). — Daget (1998). = Aspatharia divaricata (von Martens, 1897). — Mandahl-Barth (1988). + Aspatharia (s.s.) subreniformis (Sowerby, 1867). — Haas (1969). = Aspatharia (s.s.) divaricata (von Martens, 1897). — Pilsbry & Bequaert (1927). + Spatha (s.s.) dahomeyensis (Lea, 1859). — Simpson (1914). Martens, 1897, Besch. Weich. Deutsch Ost Afr. : 250, pl. 7, fig. 15. Type(s): HOLOTYPE (MONOTYPY) ZMB_108821, Simin Fluss, Victoria Nyansa.